Yep, that’s the news. My sourdough starter is gurgling and frothing away, and last week I made two GREAT sourdough loaves. (I’ll post about those later.) Having received both my starters from friends I had not really read up on caring for a starter. I just added equal parts flour and water once a week (if the starter is living in the fridge) or once a day (if the starter is living on the counter). I was reading the forums on The Fresh Loaf and discovered that I should be adding both flour and water equal to the weight of the starter. OH. That means if I have 8 ounces of starter, I need to add 8 ounces of flour and 8 ounces of water at every feeding. Though my starters have seemed healthy, they’ve been following a rather prude diet. So yesterday I gave my starter a proper feeding and wow did it froth up. Twelve hours later it had doubled in volume. I’m curious to see the renewed rising power of my post-anorexic yeast culture. I also plan to keep the starter on the counter for the foreseeable future to diminish the sour flavor – another tip from The Fresh Loaf. This new feeding schedule is going to create a serious excess of starter, so I’m stocking up on quick-bread recipes to use it up. Today I made cornmeal sourdough pancakes for lunch. They were excellent – better than the original! I simply substituted 1 cup of starter for 1/2 cup of flour and 1/2 milk from my favorite buttermilk pancake recipe. They didn’t taste the slightest bit sour or yeasty, and they were much lighter than my usual pancakes. 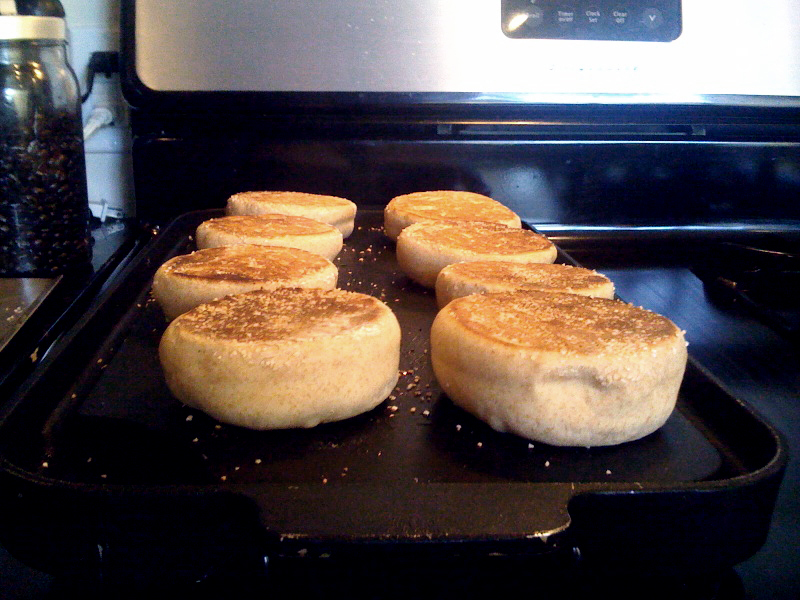 Next on the menu….crumpets and sourdough biscuits.